Ryan Miller, lead singer of the band Guster and star of a new web series on Vermont PBS, joined VPR to talk about the band's new album and his show about making friends in the state. The rock band Guster recently released their seventh album, Evermotion. The lead singer of the band, Ryan Miller, is a Vermont transplant and star of the Vermont PBS web series Makin’ Friends with Ryan Miller. He joined VPR to talk about his new adventures. "We started in a dorm room with two acoustic guitars and a guy that said he played the bongos. Turns out he didn’t play bongos; he just brought them with him to college. We sort of thrived on that limitation for the first couple years and up until our third record, where we really defined that sound and made it work into something really unique sonically. "The next iteration, I learned how to play bass and piano. Our drummer started to teach himself how to play drums, so the second iteration of our band was really kind of figuring out how to write songs with new instruments. "Now, we have a new guy in our band and so I feel like this is almost like the 3.0 version of our band and the sonics on this are different … We were sort of defined by our acoustic guitars and strumming, and I didn’t even want to play guitar on this album. I felt like I was kind of falling into some patterns, so by taking those textures out I felt like I was exploring new stuff." "He is crazy. We had never made a record in less than two months and had spent anywhere from two months to a year on a record. When I was talking to him during pre-production, he was like, 'Yeah, I’ve never made a record in longer than two weeks.' That kind of stuff, really pushing us out of our comfort zone, is exactly what we needed and want in pretty much all aspects of the band and personally. All these things are kind of tied together about staying scared and making yourself really uncomfortable in order to find new places to create from." "This new record is a lot more grown-up, it’s a lot more groove-based and it’s a lot more atmospheric. There’s more keyboard and hopefully the lyrics are better and the performances are a little bit more raw. "On our record before, we worked with this producer who would have me sing a song 60 times just to get the shape of a word right, he just came from that school, and [with Richard Swift], I was writing lyrics up until the morning of and I would be singing these songs for the very first time in my life into the microphone, and he’d say, 'Cool, do it again.' That would be the vocal double and that’s what’s on the [record]. It was much more about this sort of raw, visceral first take and we kind of knew enough, even going into the record, not to rehearse too much because we were trying to save this. And I don’t think we had ever done that before." "It was much more about this sort of raw, visceral first take and we kind of knew enough, even going into the record, not to rehearse too much." "It came from some of my favorite records, like Astral Weeks by Van Morrison, they recorded that thing in like four days or something, and there are 'mistakes' in that record but that’s what you end up loving." 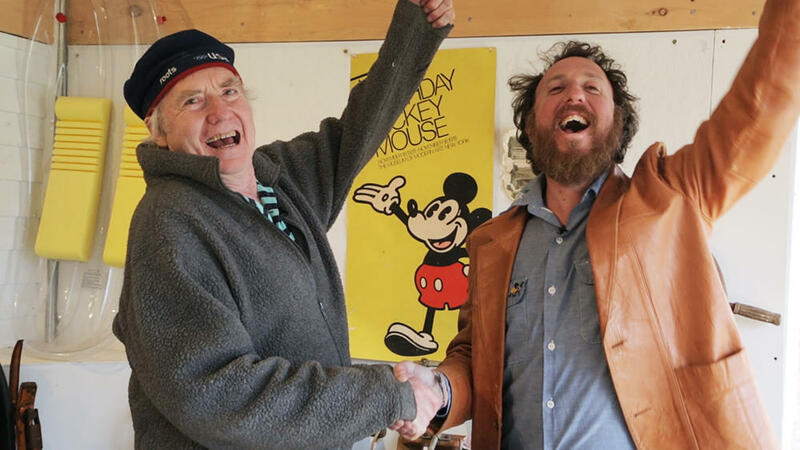 In the web series "Makin' Friends with Ryan Miller," Miller, pictured with Vermont Architect Dave Sellers, meets people for the first time on camera. "This whole thing sort of came to fruition [from] a discussion with my friend Hilary Hess at Vermont PBS. She had been tasked to do an intensely Vermont-y web series. And a big part of it for me … I want to meet people on camera. I want the first time I meet people to be something [the viewer] sees, so they all know we’re starting from scratch. There’s a clause that we built in that I can’t interview someone I already know, even though I know some cool and weird people in town." "There’s this New York Times article that came out a few weeks ago called 'To Fall In Love With Anyone, Do This,' and I felt a lot of resonance with that. It’s not, 'Let’s fall in love with each other,' but 'Let’s skip a lot of the BS. Let’s just get into it.' You get that moment where you’re actually sharing real information about what it is to be an artist, or a father, or a collaborator, or whatever it is – that’s what I’m trying to get to. Again, that’s what I’m trying to get to in life." "You get that moment where you're actually sharing real information about what it is to be an artist, or a father, or a collaborator, or whatever it is – that’s what I’m trying to get to. Again, that’s what I’m trying to get to in life." "The 'makin' friends' isn’t so self-serving of, like, I just want more interesting people in my life, which I do, but there is something that is … you’re trying to get them to reveal who they are in a really coherent, articulate way in a really short amount of time. That’s all I’m trying to do." In the 1660s, post-Puritan England experienced its own kind of sexual revolution as women enjoyed first tastes of sexual freedom and empowerment. Instead of heading to the art supplies store for materials, Montpelier artist Nick Neddo takes to the woods and forages for feathers, sticks and rocks to make his own. In 2005, Hinesburg writer Chris Tebbetts co-wrote a book titled m or f? with Lisa Papademetriou. On Jan. 24 at Chandler Center for the Arts in Randolph, a group of local actors from various high schools will present the premiere stage adaptation of the book. One of Vermont’s most unique manufacturing companies lies behind a nondescript red door in downtown Bethel. Alpaca Guitars makes a musical instrument designed to go to some far-flung places.